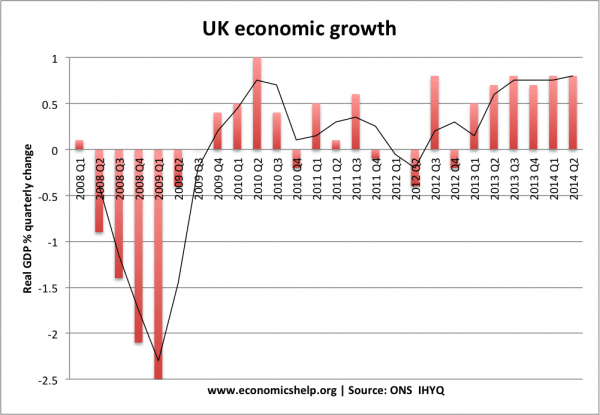 The UK recovery paints an unusual situation. We have both positive economic growth and falling real wages. 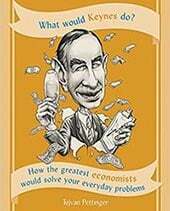 How can we have economic growth with falling real wages? Also, it is possible for consumer spending to rise despite falling real wages (at least in the short term). For example, if spending is financed by borrowing or declining savings ratio. Consumer spending could also be financed through re mortgaging houses (equity withdrawal) against the backdrop of rising house prices. Real wages have been falling since the start of the great recession in mid 2008. In a recessing falling real wages are to be expected, but since the recovery, we might have expected real wages to match the growth in real GDP. Why are real wages falling despite economic growth? 1. Flexible labour markets creating low paid employment. In this recovery, unemployment has fallen more rapidly than previous recessions. Evidence suggests the economy has been successful in creating new employment (often temporary / part-time/ self-employment). These new jobs are not particularly well paid. The recovery is good for job-seekers, but less good for those already in work. The relatively elastic supply of labour willing to take low paid jobs is keeping any wage growth low. 2. Shift in labour market. The past two decades have seen a trend moving jobs from well paid manufacturing jobs to lower paid service sector jobs – jobs which are increasingly flexible, with temporary contracts, such as zero hour contracts. This labour market shift has put downward pressure on wages. 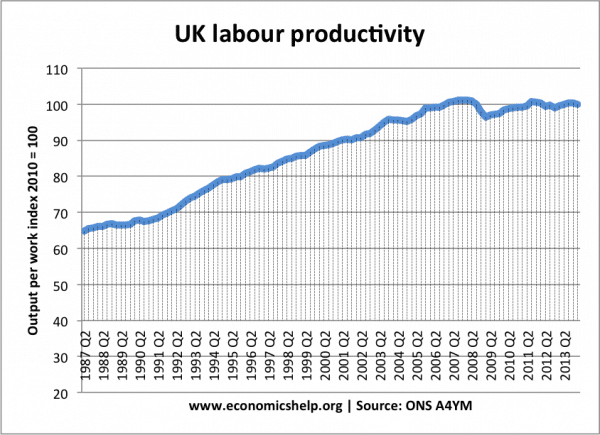 Another feature of the recovery has been poor labour productivity growth in the UK. Labour productivity has remained stagnant since the start of the great recession in 2007. The poor labour productivity growth has encouraged firms to keep wages down. ONS have stated that a major reason for low wages is the response to low productivity. 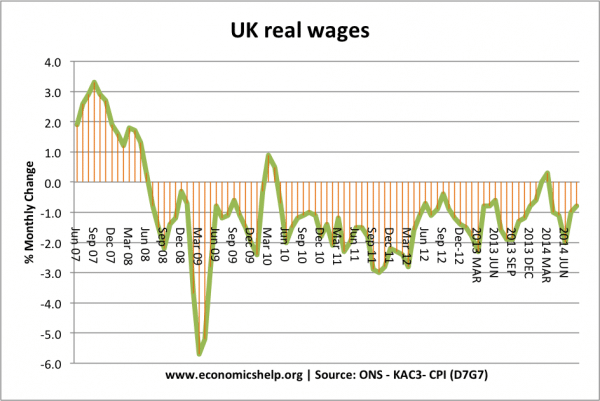 If real wages are falling where is the economic growth coming from? 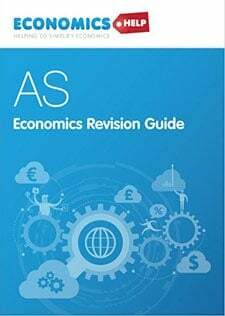 Consumer spending is the biggest component of aggregate demand (AD) with falling real wages, we would expect lower consumer spending and negative economic growth, but the opposite is happening. Where is economic growth coming from? Quarterly national income accounts 2014 Q2 – show good growth in investment since Q2 2013. Government spending has also been rising steadily in recent years, if not spectacularly. For example, benefits are tied to inflation not wages. This means that benefits have been rising faster than wages in recent years. Evidence suggests that corporations are retaining more profit. The total corporations gross operating surplus increased over 10% in the 12 months to 2014 Q2. This suggests firms are increasing profitability. But, are reluctant to spend the increased profit. 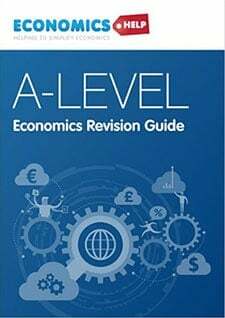 According to ONS the profitability of firms (measured by rate of return) was measured at 11.9% in Q1 2014 – higher than the past five years, though still below levels seen pre- 2008. Low interest rates have reduced the cost of mortgage income payments. Therefore, households have more discretionary income to spend, given that mortgage payments are lower than before the recession. This suggests that low interest rates are a key factor in maintaining consumer spending; it also means consumers will be sensitive to any increase in interest rates – unless real wages do increase. The UK recovery has been helped by ultra-loose monetary policy. Low interest rates have reduced the cost of debt-interest payments helping to give consumers and firms more income than they might have expected. Homeowners have been insulated from falling real wages by low mortgages. Though people who rent have not seen a similar fall in housing costs. The recovery has also been helped by a recovery in investment. Also, firms have shown an increase in profitability and retention of profit. At the moment they are reluctant to spend. But, if unemployment continues to fall, they may have to increase wages to attract labour. Nevertheless in the medium term, falling real wages creates a barrier to continued recovery. 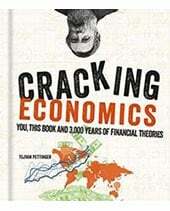 There is only so long that you can have economic growth with falling real wages. Either wages will need to catch up with the recovery or we could see a decline in economic growth. Also, despite the talk of austerity, government spending has played a role in providing some minor economic stimulus. This could change in the next few years as more government spending cuts come into focus. 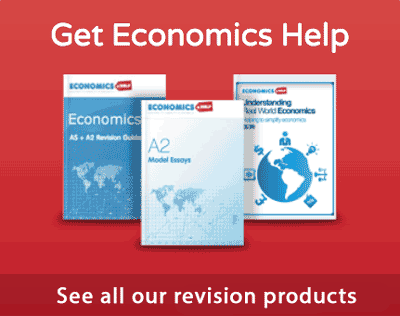 This entry was posted in economics and tagged recovery, uk economy, wages. Bookmark the permalink. GDP per capita is fairly stagnant and below pre-recession levels. The ‘growth’ is only on a country-wide basis. The share of GDP going to wages has also fallen due to inter alia employer uncertainty about business outlook. Although maybe not the place, could you please expand further on the relationship between real wages and monetary policy — in particular, how the MPC use real wage growth (or lack thereof) to help in deciding to hike/lower rates, and specifically why. Or, could you at least point me into the right direction for finding out? I’ve been racking my brains with this all morning. What effect do interest rates (either a rise, fall or steadying) have on both monetary and real wages?